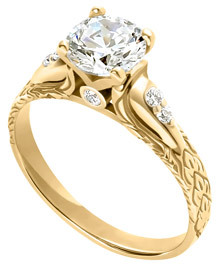 This 14k yellow gold engagement ring is engraved with a delicate leaf pattern. There are 2 diamonds on each shoulder and a bezel set diamond on each side of the center. all measuring 0.015ct each. The center setting will accommodate a diamond between 0.46 carats and 1.10 carats that you choose from our inventory.